Join the REVOLUTION with me and the incredible women of Radical Women’s Ministry! 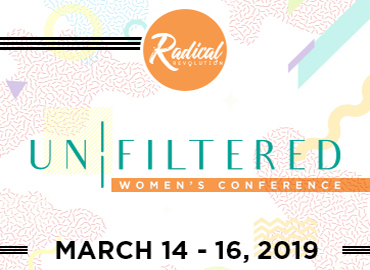 From March 14th through March 16th, we will be coming together with women from across the globe for the 2019 Radical Revolution Women’s Conference at World Changers Church International, in College Park, Georgia. This upcoming year’s conference centers around the idea of being “unfiltered.” Who are we truly when we remove societal filters and live our lives transparently? How can we become the authentic version of ourselves that God knows and created us to be? Through thoughtful dialogue, we can find the answers during this three-day, inspirational event. We welcome you to arrive early March 13th for our Pre-Event Pajama Party from 7pm to 9pm! This is a great opportunity to bond with women and build a sense of community before the featured events begin. Starting Thursday, March 14th at 11am, each day is filled with candid talks and workshops led by myself and empowered women such as Dee Dee Freeman, Maranda Curtis, Sarah Jakes Roberts and many more! Explore the unfiltered, inspired side of womanhood through everything from in-depth talks about budgeting to morning yoga to hair and makeup tutorials. See our full event schedule here. After you delve into what it means to be “unfiltered,” you are invited to an exclusive premiere of Unfiltered, a documentary that welcomes you into my life’s journey through hardships and blessings alike as I help spread the message of Biblical equality. Immediately afterward, I will answer your questions in a live Q&A session! This is a life-changing experience you don’t want to miss. Register early to reserve your spot at the Radical Women’s Conference. Early-bird tickets are only $45 per person for a limited time! Students with a valid ID can purchase tickets for $25, and group tickets can be purchased with the code girlstrip. Click here to register and see all of our ticket options.